ASHEVILLE, N.C. (MuseWire) – Moog Music has announced the release of Minitaur, the newest addition to Moog’s Taurus Bass Synthesizer family. Minitaur is a compact and powerful analog bass synthesizer that features a classic one knob per function layout. Most notably, it is the first instrument in the Taurus family that does not have foot pedals. At only 8.5” x 5.25” and less than 3lbs, the Minitaur puts powerful analog Moog bass into a package designed to fit seamlessly into today’s performance and production environments. The Minitaur will be introduced at Winter NAMM Booth #5000 at the Anaheim Convention Center, January 19-22, 2012. The release of Minitaur marks the next chapter in the Taurus family history, by introducing a new form factor, control interface and increased level of accessibility. 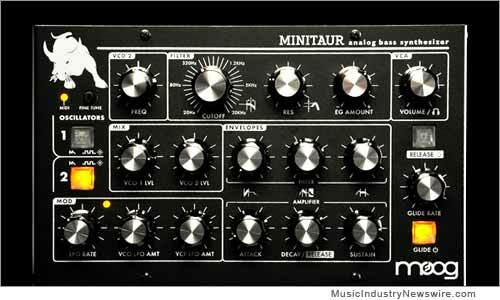 “The Minitaur has all the growl, snarl and body associated with the Taurus family of bass synthesizers. We’re really excited to be able to offer this in such a compact package that is both immediately playable as an extremely versatile analog synth and also integrates seamlessly into the world of MIDI and USB control environments,” says Cyril Lance, Chief Engineer of Moog Music. The Taurus Bass Pedals enjoy a nearly 40-year history and have made a seismic impact in the music world since their introduction in the mid-Seventies. “The Taurus opened up so many possibilities for me…it also opened up a whole way of looking at what I do,” says Geddy Lee, of the multi-platinum band Rush. In 2009, Moog Music released the Taurus 3 Bass Pedals, a modern reinterpretation of the classic Taurus Bass Pedals. The Taurus 3 is currently used by artists such as The Black Keys, Animal Collective, Jean Michel Jarre, Yes, Weezer, Rush, and The Dave Matthews Band. Since the inception of Moog Music, Bob Moog tested his ideas, instruments and sounds on musicians as a key part of the product development process. In keeping with this tradition, Minitaur has been presented to a broad array of producers, artists and songwriters including Geddy Lee of Rush, techno legend Derrick May, Flying Lotus, Moby, Holy F*ck and renowned record producer Nick Raskulinecz as a part of the final product development process. The enthusiastic response from these artists marks the beginning of the next generation in the Taurus Bass Synthesizer line. Shipping in Spring 2012; Price: $679.